While regular Greubel Forsey timepieces are already esoteric in their own right, the Art Pieces lineup takes the aesthetical designs yet a step further. 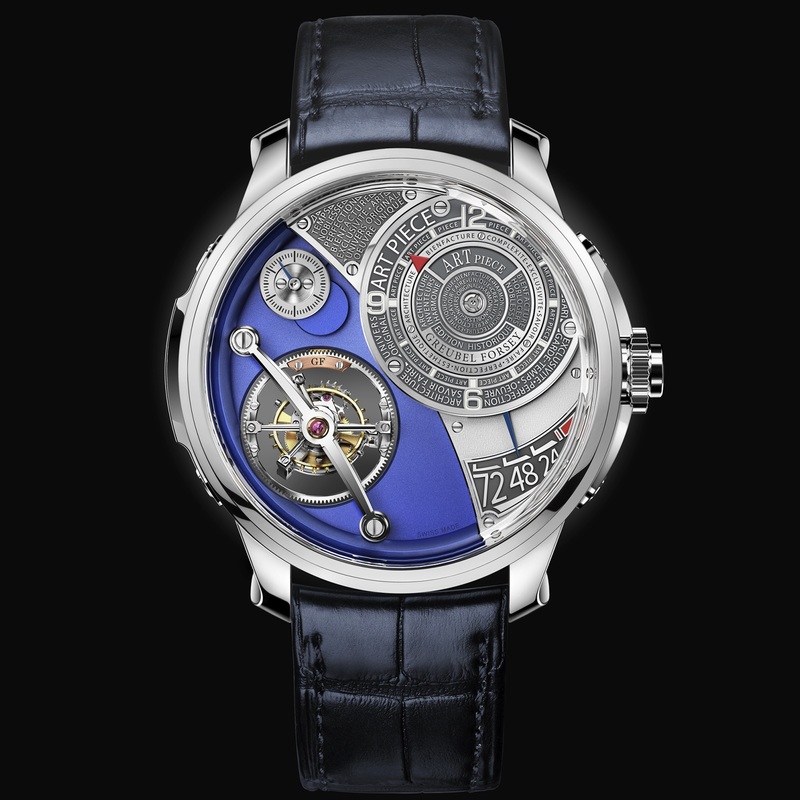 The flagship of the brand’s SIHH 2019 line-up, the Art Piece Edition Historique is avant-garde in style, emphasising two signature elements of the brand – the double, inclined 30° tourbillon and relief micro-engraving of the Greubel Forsey philosophy. The double axis inclined tourbillon is not new but nevertheless still impressive; it features the same tourbillon carriages found in other Greubel Forsey double tourbillon movements. It rotates the balance wheel in multiple planes which, in theory, averages out positional errors more uniformly as compared to a regular movement. While the outer carriage rotates gradually at one revolution every four minutes, the inner carriage completes rotating in 60 seconds. 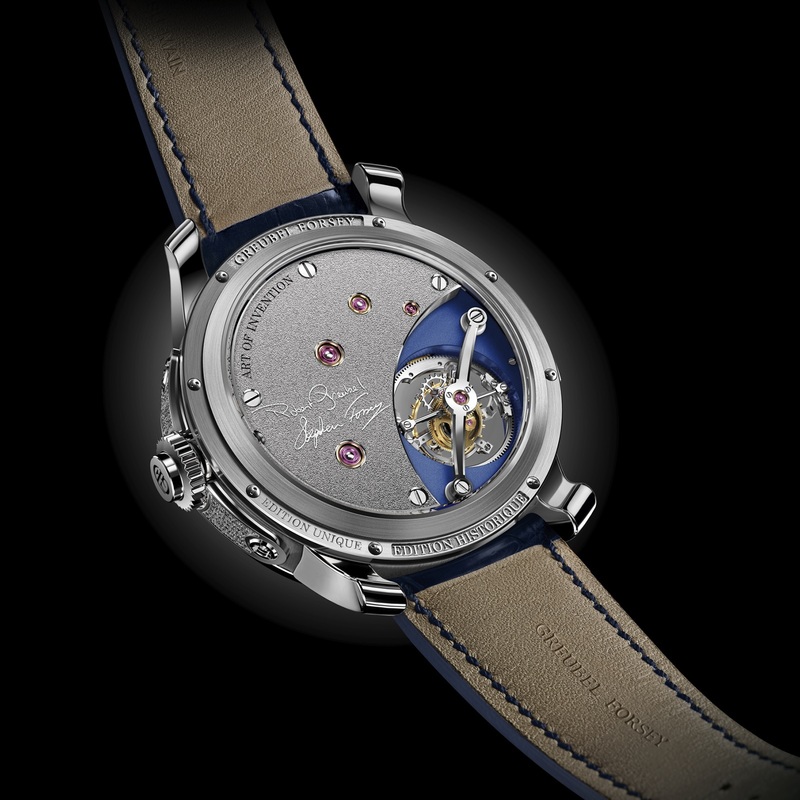 The tourbillon is prominent atop the frosted, blue coated titanium main plate, which is deeply recessed in contrast to the raised half of the dial, giving a strong sense of depth. This is further emphasized by the massive domed sapphire crystal and large case size of 44mm by 15.95mm, which gives an excellent all-round view of the geometric dial surfaces. The raised half of the dial is of strong interest – being intricately engraved in relief with the brand’s values, done so small as to resemble hieroglyphics. The engraving extends to the wide flanks of the raised dial, further utilising the architectural depth as a visual advantage. Interestingly, the only apparent time indication on the dial is a red marker for the hours and a small sub-dial for seconds. The minutes are in fact, displayed in a window covered with a shutter that’s opened on-demand via a pusher on the crown. The lower half of the dial is simpler, with a blued steel pointer to indicate the 72-hour power reserve. In stark contrast to the dial, the caseback is minimalistic – being dominated by a large, frosted three-quarter plate. Breaking the monotony of the expansive plate are gold chatons holding the jewelled bearings, and also relief-engraving of the signatures of Robert Greubel and Stephen Forsey. 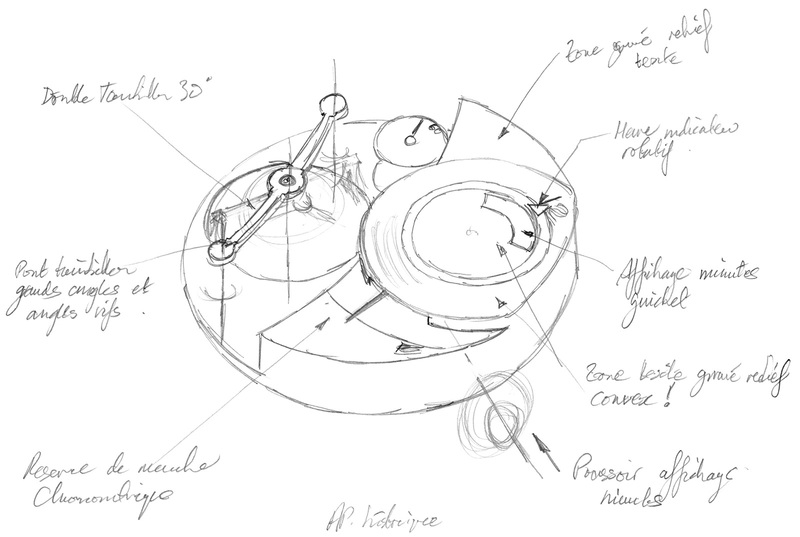 Nevertheless, the unadorned appearance belie what’s underneath as the movement consists of a staggering 475 parts, with 130 for the tourbillon alone. This is plenty for what is essentially a time-only wristwatch with a power-reserve indicator and a jumping complication for the minutes aperture shutter. 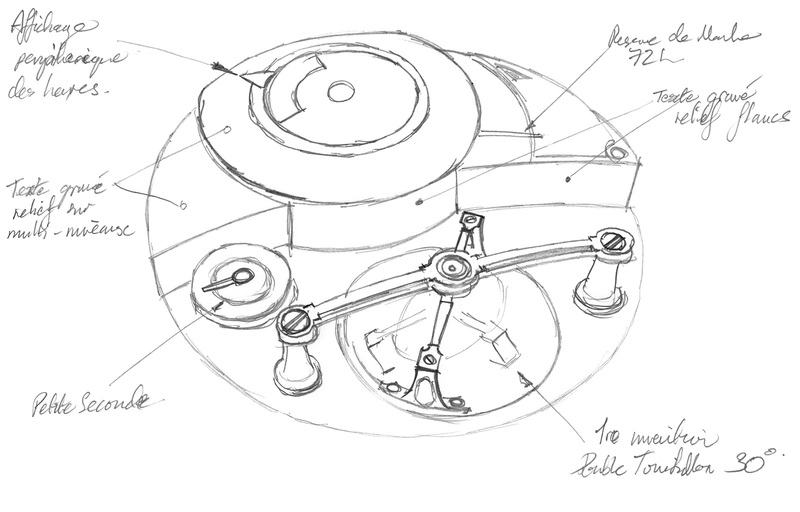 The movement is also equipped with two mainspring barrels coupled in series, with one having a slipping clutch as found in automatic movements to prevent overwinding. 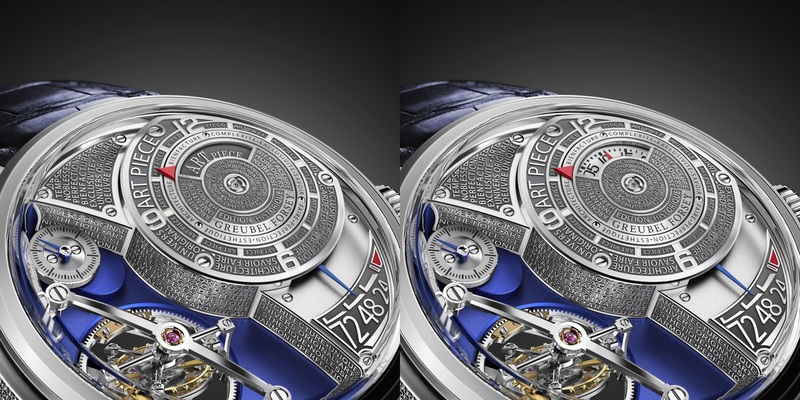 Either way, the view still remains interesting with the underside of the intricate tourbillon carriages visibly held by a slender, black-polished steel bridge that mirrors the bridge on the front. Not to mention the elaborate and meticulous finishing abundantly present throughout the entire movement that Greubel Forsey is revered for. 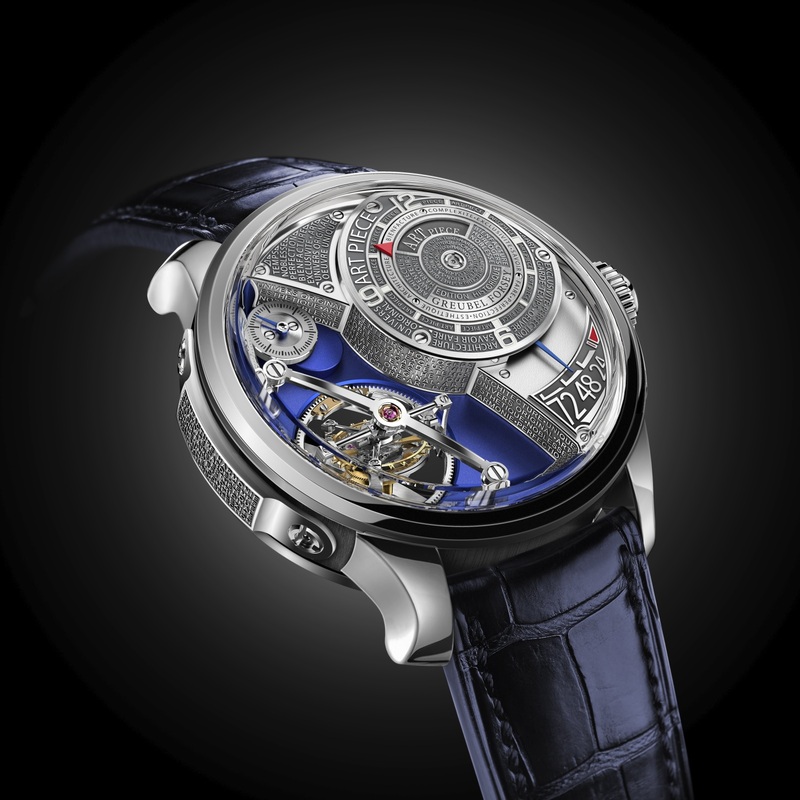 The Greubel Forsey Art Piece Edition Historique is limited to 33 pieces, with the first 11 pieces in platinum and subsequent models in other materials. Priced at CHF555,000 before taxes.